The Preferred Body Shop Option–We’re On Your Side! The insurance companies may tell you it’s totaled, but that doesn’t have to be the final word on it. NCA Auto Body Repair has a team of experts that will get your prized possession back on the road in no time! We treat every customer with the same commitment to excellence, perfecting the auto body repair experience and making it hassle-free. It’s not our facility that makes us the best, it’s our people. Auto body expertise and integrity make us the preferred body shop option in the Hooksett area. Our shop treats you like family so when you come to us you’re in good hands. We specialize in guiding our customers from the moment they step into our shop to the moment they drive away in a fully-repaired and fully-restored vehicle. 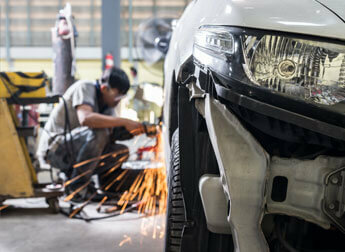 NCA Auto Body Repair wants any unfortunate accident to be much easier to handle. Our goal is to make sure all Hooksett drivers know where the should come for any body work. NCA Auto Body’s expert repair services put you back on the road faster and keeps you there. Accidents and collisions are stressful enough. Let us take away the anxiety over when your vehicle will be ready. Our team will get you back to the highway faster. We use the best quality parts for all repairs and replacements, maintaining the same standards you enjoyed before the accident. Quality paint services are always the finishing touch, and you can come to us for any spotless paint services. NCA Auto Body wants customers to know that we’re not working for the insurance companies. We’re working for you. Your complete satisfaction is our only goal. When owners experience an accident, they believe it’s the insurance company that’s on their side. But sometimes their goals conflict with the vehicle owner’s goal. And guess who’s gonna win in the end? That’s why we’re here to help you get back the vehicle you need. Come Experience Expert Services Today! Ask around about us. We’re Hooksett’s best kept secret. Owners who’ve experienced our top of the line auto body repairs know that we’re your vehicle’s best option. NCA Auto Body Repair maintains a higher standard so that we continue to exceed customer expectations. We keep it simple! The goal is to give you back the car you’ve been missing, looking better than ever. Give us a call today at 603-668-1768 to get our top of the line auto body repair process started. To save yourself some time, go ahead and use our online scheduling system. Pick a time and day that works best for you, and our expert team will meet you here!